Survival Wisdom is a large-scale practical guide, jam-packed with information on every aspect of outdoor life and adventure. 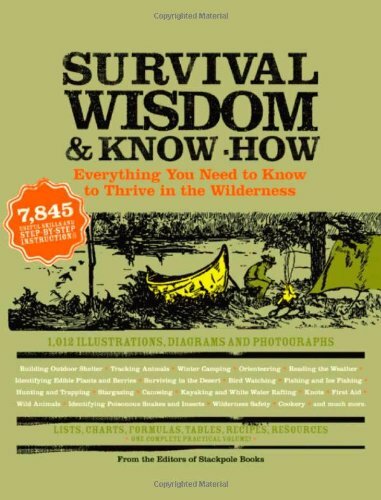 Survival Wisdom & Know-How is the most complete, all-in-one volume on every aspect of outdoor adventure and survival ever, from orienteering to campfire cooking to ice climbing and beyond. Culled from dozens of respected books from Stackpole, the industry’s leader in outdoor adventure, this massive collection of wilderness know-how leaves absolutely nothing to chance when it comes to surviving and thriving in the wilderness—and appreciating every minute of it. Topics include Building Outdoor Shelter, Tracking Animals, Winter Camping, Tying Knots, Orienteering, Reading the Weather, Identifying Edible Plants and Berries, Surviving in the Desert, Bird Watching, Fishing and Ice Fishing, Hunting and Trapping, Canoeing, Kayaking, and White Water Rafting, First Aid, Wild Animals, Cookery, and much more. Useful illustrations and photos throughout make it easy to browse and use. With contributions by the experts at the National Outdoor Leadership School (NOLS) as well as the editors of Stackpole’s Discover Nature series, Survival Wisdom & Know-How is the definitive, must-have reference for the great outdoors.